Diamondback Apex . Cairns, 1996. It occurred to me the other day, the last time I bought an actual "complete" bike was between 1993 and 1996. A DiamondBack Apex. It was funded by my wife's redundancy package. Ever since then my bikes have been built up from parts that I managed to acquire by various means, rummaging through other peoples rubbish bins, doing contra deals for people, usually in the form of websites in exchange for bits and pieces, or being at the right place at the right time, or just by knowing someone who had some spare gear to move on. I was very lucky to provide webmastery duties for Kiwi Pro MTBer Kashi Leuchs for quite a while when he was a pro cyclist, which meant I had access to some fruity kit in exchange for web services. This post is a bit of a ramble on some of the cost saving hacks I have done through that difficult poor/married-with-children/paying-off-a-mortgage time of your life, the period that lasts just long enough that by the time you get through it you are really worried about what you are going to live on when you retire. 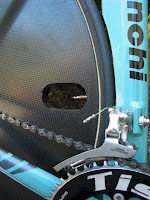 Tri-spoke conversion and cluster to fixed conversion in use. Once I brought a very cheap HED trispoke off the Internet in the early days. I was disappointed to see when it arrived that it had a screw-on cluster. There was no mention of that from the dodgy seller, not that you need any more than 8 gears to Time Trial successfully, but it was the principle that erked me. I spoke to one of the Neil's in at VIC cycles. The shorter Neil said to me, We can convert it to a front if you like mate? Piece of cake. With the old internals pressed out and a new set of bearings pressed in, I think from a Sansin hub, I had a new front trispoke that performed very well on the local vets and nationals time trial circuits, and is still in use today. 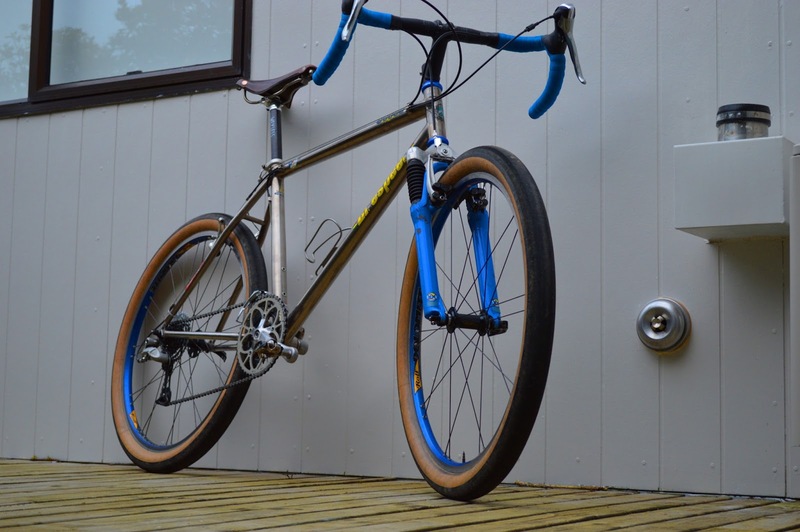 One day I came across a buddy Ed selling his carbon Corimma disc. 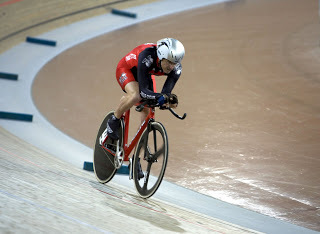 He was in the NZ cycling team, and the airline had been kind enough to poke a hole through his wheel while returning back from his training camp in France. My buddy Susie was an ex yachtie and her Dad, a multiple world Duathlon champ in the over 70s class knew a thing or two about working with fibre-glass and resins. He patched it up nicely and with a new sticker over the blemish it was good to go. It turned out to be a very good and cheap disc on the whole and it saw plenty of action at Nationals and local events. I got into track racing for a short time and some how got gifted an old HED screw-on disc. I cant recall where it came from, but it was pretty old. I did some research and found that I could convert it to a track wheel with a kit brought from the US. 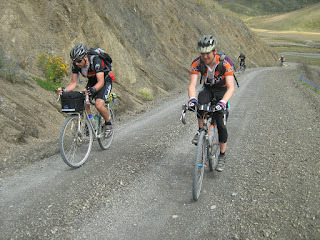 I did a post about it here and it often gets hits from trackies and fixed gear aficionados from around the world. 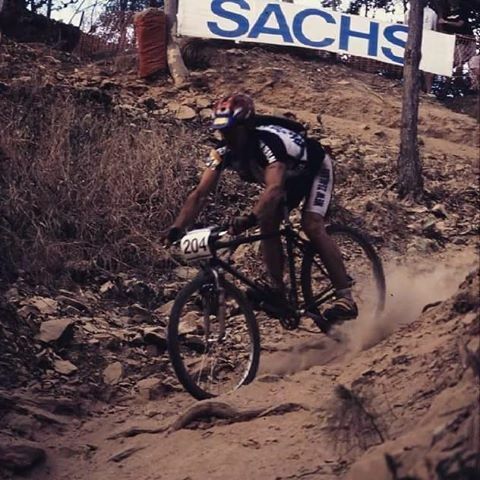 Back in the late 80's and early 90's as a masters MTB racer I was always coming up against Marco Renalli. Marco was the opposite of me. I was poor and married with children. 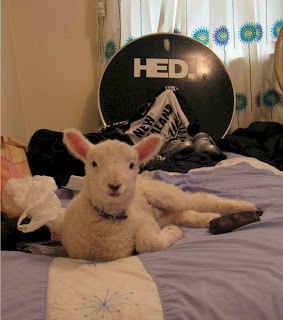 He was a bachelor with a shed full of shiny toys, but he was always very generous with his old gear. If something lighter came out, I could often get the previous years model with a bit of wear and tear and usually a whole bunch of extra holes bored in it, at a very discounted price. One day while Marco was commuting to work he was sadly knocked off his bike and sent to hospital with a broken leg. Marcos bike was bent and written off by the insurance company. I had a look at it and showed a buddy Mark who worked at BRANZ. They had a large hydraulic press there. One of Marks buddies did some measurements on it, tweaked it under this press, remeasured it and declared it a success. 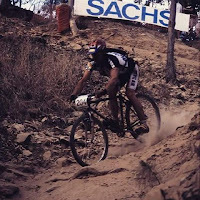 A couple of years later, on that bike, built up mostly with Marcos old discarded parts on it, I won the Masters 2 national MTB series on it and beat Marco into second. Thanks moit ! Being Kashi's webmaster meant that I had access to some very fruity gear that became surplus to his requirements and was often traded for webmastery duties. For a while he was a privateer between gigs, after the dissolution of the Volvo Cannondale team and had some help from the fruitiest of all component makers - Tune! Somehow I ended up with a lovely Tune Big Foot crank. 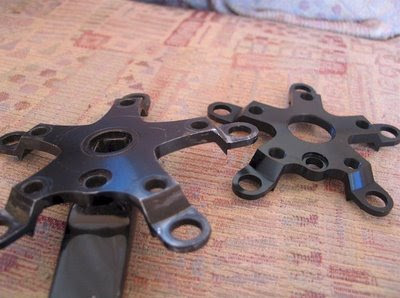 I cant remember why, but at one stage I learnt that I could swap out the crank spider from the ATB format to the Compact format, or vice versa. The problem was how? There is probably actually a special Tune tool that costs 400 Euro for this actual task. I found that if I undid the spider locator bolt, installed the crank on my track bike, and pedaled backwards, I could unwind the crank arm off the spider! A very hand hack for the hundreds of you out there with Tune cranks and track bikes ; ) details here. Cheapie Tune QR to Thru axle conversion. My cousin Paul, who is not really my cousin but might as well be, given his Luddite tendencies sent me over a QR (quick release) Tune front hub one day, because it wasn't through axle, and he had just joined the "big hit" brigade. 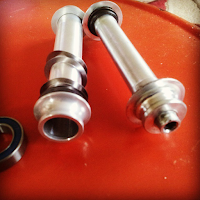 I did a bit of research and found that I could punch out the bearings from the QR front hub, and replace them with the same externally sized bearings that Hope use in their rear wheels, and poke in a new Tune thru-axle axle. This was a hell of a lot cheaper than buying a Tune thru-axle swap kit complete with bearings from Germany, or a new Tune TA hub $$. I got it built up into a new wheel for the only bike I have with a thru-axle fork. Once again, not much use if you don't have a Tune hub, but its the thought that counts. Full details in a post here. The poor mans Diablo (PMD). This is a sound alternative to the expensive Exposure Diablo, which has a pretty legendary reputation amongst Bikepackers. Based on the same 18650 battery, which also powers most lap-tops (easy to find) and a cheapie 10$ torch you can get some reasonable candle power. Full details here. 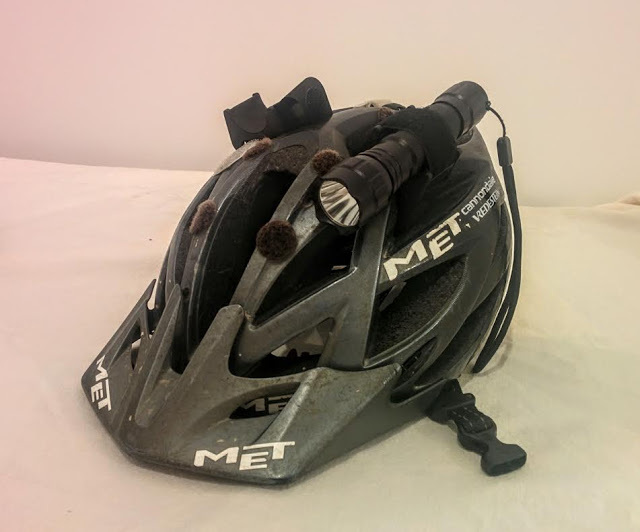 In my latest iteration I have replaced my helmet mount with a zip-tied on pump mount, it's more robust, some of that Chinese velcro is not much cop. Copyright Doozy. In my tool-kit I always carry a tiny scalpel blade with me, they are light and obviously very sharp. Many places in NZ have Flax growing on the trail or side of the road. You can always slice of a thin piece of Flax and use it much the same way you would to tie up broken stuff with a zip-tie. It's incredibly strong. I guess the point is that you don't always have to spend a lot of money on kit if you are willing to fix, hack, bodge or make-do your way to a solution more in keeping with your financial situation.